By Terry Dunn on March 22, 2017 at 7 a.m.
Who knew that RC flying and weightlifting could be morphed together? Who knew that RC flying and weightlifting could be morphed together? All you have to do is omit the dumbbells and tight Lycra outfits of weightlifting. Then get rid of the aerobatics and crashes of RC flying. Oh, wait…keep the crashes. There are lots of those in RC heavy-lifting! The Society of Automotive Engineers (SAE) has been hosting heavy-lift competitions for collegiate teams since the 1980s. It has grown to include two events each year, SAE Aero Design East and West. Not only is the competition fierce, just getting in can be a challenge. Spots fill up fast and many teams are pushed to a waiting list. 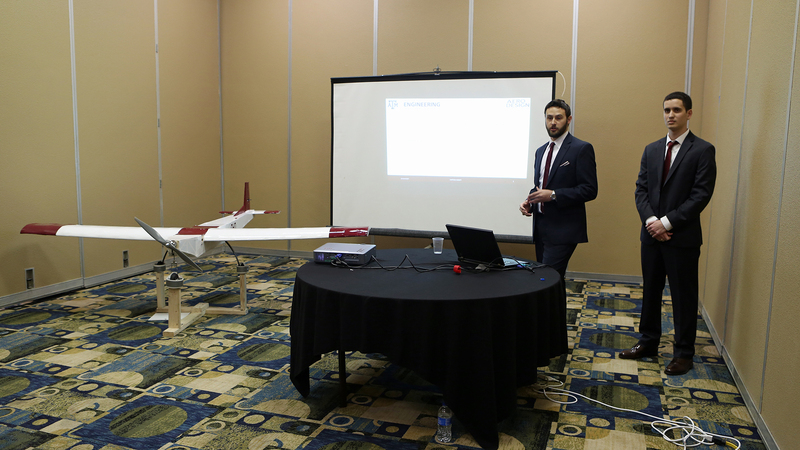 SAE Aero Design West for 2017 took place in Fort Worth, Texas during the second weekend in March. 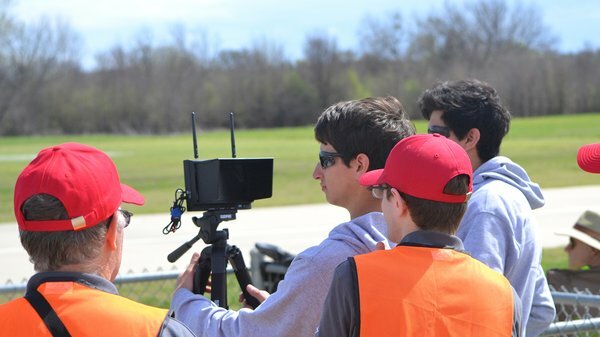 SAE and the Fort Worth Thunderbirds RC club hosted more than 70 teams from colleges and universities all over the world. Most of the teams had been preparing for months to get to this point. Some would find success as aerial pack mules. Others, well…not so much. The event is divided into three distinct classes: Micro, Regular, and Advanced. While the overall goal for every team is to carry a relatively heavy load, each class has its own specific rules and objectives. In the Micro class, the airplanes could be disassembled into subcomponents. These pieces were stored in a tube no more than 6 inches (15.2 cm) in diameter. The length of the tube was not defined, but the overall weight of the loaded tube could not exceed 10 pounds (4.5 kg). The scoring system encouraged smaller tubes. Some teams managed to pack their model into tubes as short as 3.5 inches (8.9 cm)! Micro-class airplanes could be disassembled to fit in a 6"-diameter tube. The shorter the better. As the class name and its packaging requirements suggest, the Micro models were often quite small. Many had wingspans of 30 inches to 40 inches (76.2 cm-101.6 cm). 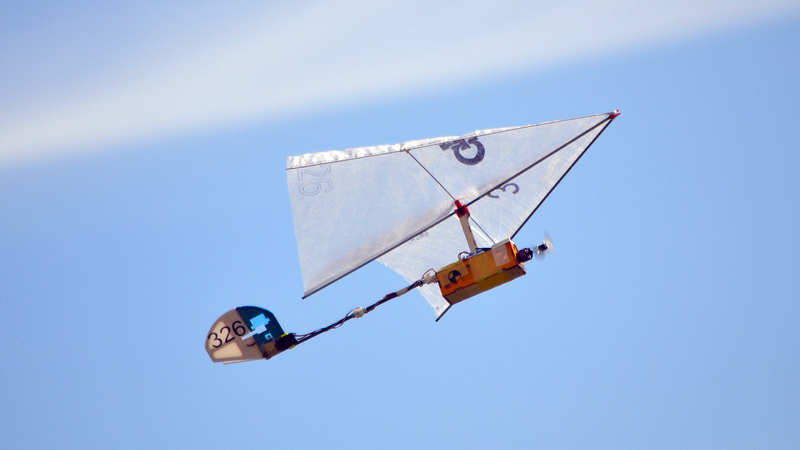 These little electric-powered flying machines had the most variation in design of the three classes. There were definitely some very clever and eclectic ideas on display. The prime goal for the Micro-class flyers was to complete one orbit of the flying field while carrying a payload. Each flight started with a hand launch. The landings were particularly challenging in this class because even a successful flight would earn zero points if any part of the airplane (other than a propeller blade) detached when flying or landing. Lacking landing gear, belly landings on the grass field took their destructive toll on the heavily-laden micro contenders. Additional points could be earned for speedy assembly of a micro model. The clock started with the airplane tucked away in its tube and stopped when it was ready to take flight. The fastest teams completed the transformation in well under a minute. "Regular Class" is a horribly inaccurate misnomer. There was nothing regular about these impressively large and graceful airplanes. The Regular-class contenders pretended to be airliners. Their goal was to haul tennis balls that represented paying passengers. At around 2 ounces (56.7 gm) each, a 2.6-inch-diameter (5.6cm) tennis ball takes up plenty of space, but isn't much of a mass burden. So the airplanes were also required to carry 8 to 12 ounces (227 gm to 340 gm) of "luggage" for each passenger. That mass added up quickly! Regular-class models carried tennis ball "passengers" and their simulated luggage. Regular-class models had no size restrictions, but were limited in the amount of power that their electric motors could produce. The power systems had onboard governors that kept power capped at 1000 watts. While that may sound like a lot of power, keep in mind that we're talking about very big airplanes hauling 20 to 30 pounds (9 kg to 14 kg) of tennis balls and metal ballast. Tribal knowledge in the RC community dictates that you need at least 50 watts per pound (total flying weight) for a viable power system. 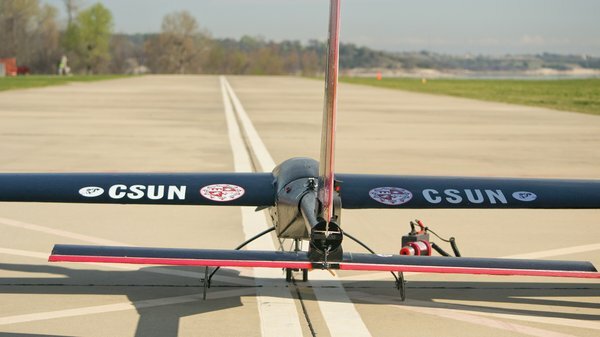 Most RC sport airplanes have 100 watts per pound or more. My rough estimates suggest that some of the Regular-class planes were taking wing at around 25 watts per pound! 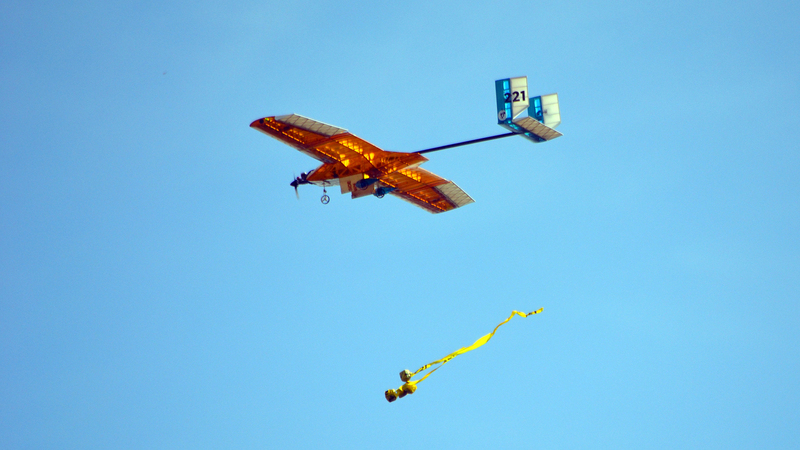 As with the Micro class, Regular-class competitors had to complete one circuit of the field for a successful flight. The Regular models, however, were equipped with landing gear and could use up to 200 feet of runway for takeoff. That presented its own unique problems, as I'll explain in a bit. The Advanced-class airplanes were similar in size to many of the Regular models but their mission made them inherently more complex. These airplanes carried both a static payload, as well as one or more payloads that were released in flight. These droppable payloads, each weighing about 2.25 pounds (1 kg), represented humanitarian aid packages being delivered to needy recipients. The drop zone was a series of concentric circles painted onto the grassy field beside the runway. Its outer diameter was 120 feet (36.6 m). The pilot was guided over the target via verbal commands from teammates using a video feed and data telemetry streaming from the airplane. A payload specialist released the payload at (hopefully) just the right time. The closer the "packages" were to the center of the target, the higher the score. Airplanes in the Advanced class released payloads into a marked drop zone. Rather than electric motors, Advanced-class airplanes were powered by internal combustion engines. The total allowable displacement for all engines was .46 cubic inches (7.5 cc). Most contenders chose to use a single engine, but one twin competed as well. This event is not just a fun weekend at the flying field. The first day of the competition took place completely indoors as teams presented their models for technical inspections. The airplanes had to meet very strict design and safety requirements to get an approving nod from the judges. At this early stage in the competition, it was clear that many of the competitors had no prior experience with RC models. We all have to start somewhere. Equally evident was the fact that many of the foreign teams did not have easy access to common off-the-shelf RC components…not that they would (or should) let that deter them. Even simple items like control surface hinges had to be fabricated by some teams. Such examples of ingenuity born out of necessity were impressive. The teams also has to present written and oral reports about their designs. Judges asked pointed questions about design choices. 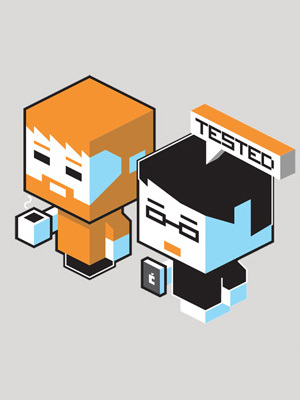 They also probed into some of the teamwork challenges that may have creeped in over the course of the project. These activities were graded and factored into the team's overall score. Flying began early Saturday morning. As in life, there were no throw-away flight rounds. Every flight (or lack of) counted. Many teams quickly found out that it was deceptively easy to score a goose egg. All it took was a soft hand launch or a miscommunication at the starting line for a flight to end before it ever began. Micro-class models had to be hand-launched and belly-landed, which caused problems for a few teams. There were a lot of crashes in that first round, especially in the Micro class. Something more amazing than the sheer number of crashes, was how many airplanes returned for round two. Throughout the weekend, crashed models that would normally be thrown into a garbage can were miraculously pieced back together, inspected, and flown again. Teams could provide their own pilot or use one of the ace pilots provided by the Thunderbirds club. Those guys were good! There were lots of tense moments as these veteran flyers coaxed overloaded airplanes around the pattern time after time. No matter who was at the controls, every successful landing earned cheers from the crowd. 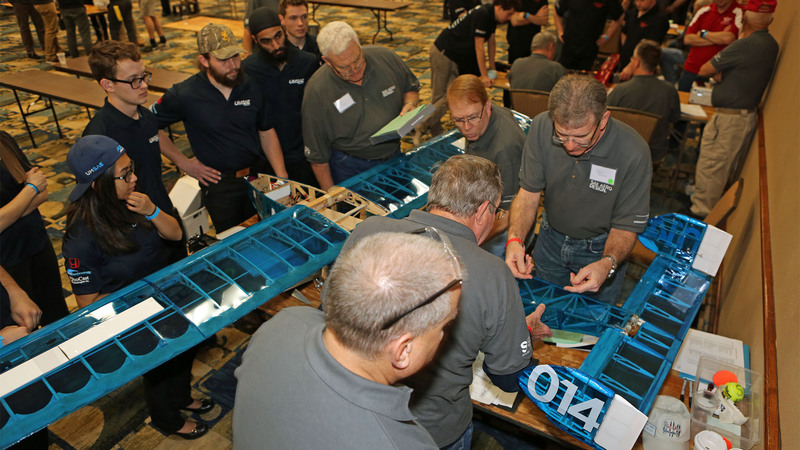 By the third round of flying, the more consistent and well-prepared teams began to emerge in each class. Not that any team was immune from gremlins. Some groups just found more-effective ways of keeping them at bay time after time. There was a huge variety of designs that competed. 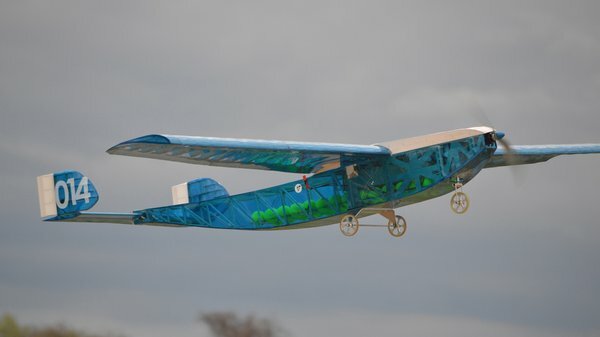 This Rogallo-wing model captured first place in the Micro class. What I found interesting was how many of the failures were unrelated to the airframe design or craftsmanship of the teams. For the most part, that work was solid. A lot of unsuccessful flights in the Regular class were due to over-burdened landing gear. Wheels and mechanisms that would likely perform just fine on a standard RC model just couldn't cope with the extra weight of these loaded down airplanes. The Advanced-class drop zone seemed to have an invisible shield surrounding it. 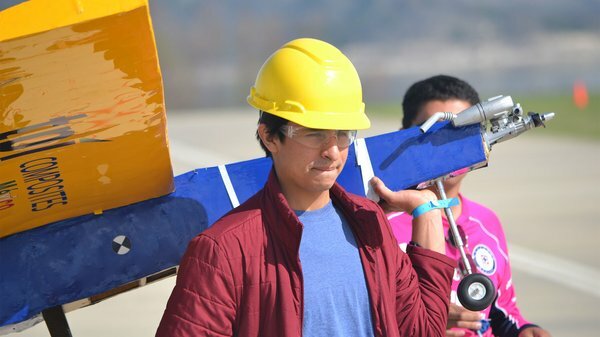 Teams were allowed to drop their payloads from as low as 100 feet (30.5 m), but close drops were elusive. Only 5 of the 17 teams managed to score any drop points at all. Then in the final, 6th round, Georgia Tech placed all of their packages right on the bullseye. That feat helped push them to the top of the class. 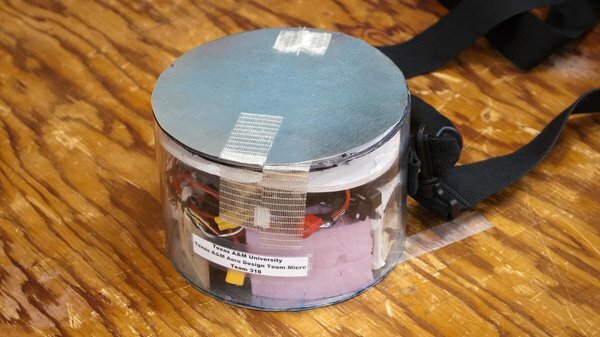 Advanced-class teams used video and telemetry systems to help aim their payload drops. The final two flight rounds were completed on Sunday morning. 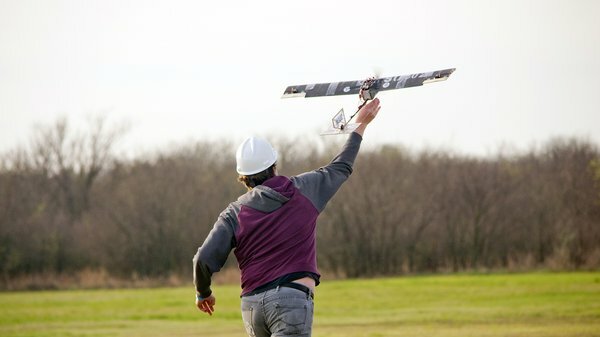 Some teams that had been plagued by problems all weekend were finally able to get in a successful flight. Those landings resulted in high-5s and much relief. Unfortunately, a few of the teams were never able to complete a flight. Watch out for those teams next year…they're hungry. After the final flight round, points were tallied and the winners in each class were named. There's no doubt that all of the participants walked away with a much better understanding of what it takes to design an airplane. This competition illustrated that the rigid technical side of things is important, but so is the softer, human aspect of coming together to make things work. This was an RC event unlike any that I had ever been to before. Even if you're not into RC airplanes, there was plenty to keep spectators intrigued and entertained. I look forward to returning next year. For those of you on the east coast, you can still catch this year's SAE Aero Design East in Lakeland, Florida April 21-23.